Newly deployed cloud servers usually require some steps to set up. Everyone has their own list of things to go through from adding new user accounts to running updates and installing common applications. With Initialization scripts, you can automate the tasks you would otherwise perform again and again when booting up a new host. You can manage your scripts with the Initialization scripts feature at your UpCloud control panel under your Account section. Click the Add new button at the top of the page to open the editor window. Copy any pre-existing script you might have into the script text field, or write a new script straight in the browser. Name your scripts so that you can easily distinguish between them. Once you are done, click the Update script button at the bottom to save the changes. The Initialization scripts are supported by all of our public Linux templates. After adding any SSH keys you may wish to use, you can find the option to load your previously saved initialization scripts. Selecting one of your stored scripts will bring it to the edit field below. You can make any last-minute changes to the script still before deployment, or you can write a completely new script right on the spot. Once you are done making changes, click the Create button as usual to deploy the new server. The server will perform the actions dictated by the script during the first boot up saving your considerable time and effort. Testing new initialization scripts is also easy thanks to the extremely fast deployment to any of the UpCloud availability zones. If your script didn’t perform as expected, you can always delete the server and deploy it again. 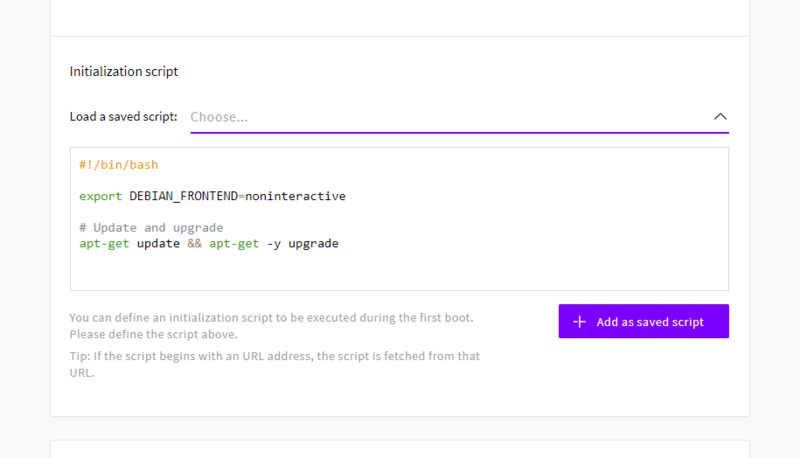 Iterating your scripts will let you fine-tune the tasks at boot up and be running again within seconds. Initialization scripts support anything a regular Linux shell script would. Depending on your choice of distribution, the default shell might use different implementations, but the principles remain the same. Below is an example of how to have the server automatically run the update and upgrade routines as also seen in the picture above. CoreOS has its own initialization script format using a setup file cloud-config. A program called coreos-cloudinit reads the config file at boot, which allows a new node to e.g. be automatically discovered and connected to a cluster. It is also possible to enter a URL in an initialization script. If the script contains an address, the deployment process will attempt to fetch the script and use it instead. This allows greater flexibility including dynamically updating the initialization script between deployments.